We Illinoisans derive some pride in knowing Ray Bradbury’s classic tales were influenced and informed by his environs growing up in Waukegan, Illinois. One of the first books that lit my fire for wanting to write fiction was Bradbury’s Fahrenheit 451. Today Ray Bradbury would have been 94, and I encourage those of you reading this to pick up his stories again. Really read them. No, really. Read them in the context of what’s happening in the world around you today. Like C.S. Lewis’ stories The Great Divorce and The Screwtape Letters, Bradbury’s legacy is his relevance, which withstands the test of time. 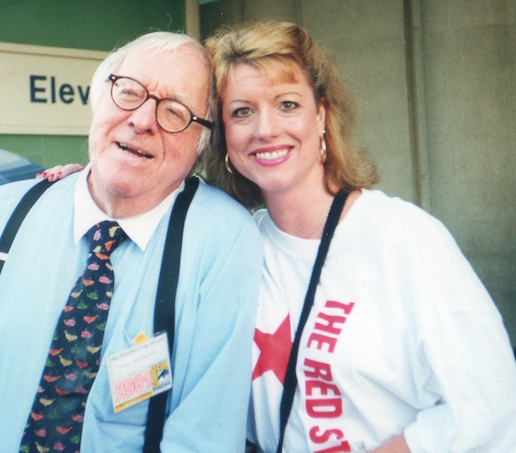 I was fortunate enough to cross paths with Ray Bradbury at San Diego Comic-Con for many years. In this photo, he was still bipedal, walking with his walker in 2001. He was always dressed to the nines, a sweet, pleasant smile planted on his face, always animated with the fans. By the following #SDCC, he was in a wheelchair with a blanket over his lap, but still smiling and very engaged with his fans. He was positively lovely. One of our foremost pop culture expert friends is John Hitchcock, an author in his own right and owner of Parts Unknown Comic Book Shop in Greensboro, NC. I recall him telling me one of his favorite moments in geekdom was witnessing history unfold in a small room San Diego Comic-Con panel Ray did with Forrest J. Ackerman around that time. Miraculously, before that panel, the two had never met before. When people ask me, “What is so great about Comic-Con, anyhow?” I think not of the crowds, the money we lose exhibiting there, or the sheer exhaustion of the five-day show. I think of improbable, magical moments like this one: Me, a small-town girl from Illinois farmlands, touching greatness for one brief moment in time. Posted on August 23, 2014 by DaveandDeniseDorman	• This entry was posted in Entertainment, Geek Culture, Nerd Culture, Pop Culture, Publishing, San Diego Comic-Con and tagged C.S. Lewis, Fahrenheit 451, Forrest J. Ackerman, Geek, John Hitchcock, Nerd Culture, Parts Unknown Comic Book Shop, Pop Culture, Ray Bradbury, San Diego Comic-Con, Science Fiction. Bookmark the permalink.